Update your bathroom with the clean look of a KRAUS Elavo Series ceramic sink.The versatile design features a premium baked-on glaze for a high-gloss finish that's easy to clean, and complements any decor from classic to contemporary. Dimensions 20.86 In. X 14.37 In. X 7.6 In. Beautiful Kraus bathroom sink. I ordered the smaller of the two sizes, for reference I have an 84 inch double vanity. The smaller sink fits perfect. Beautiful high quality sink. Just had them installed today, so I can't comment of draining as of yet. I have Kraus sinks throughout my house. Have been 100% satisfied with all of them . We were a bit concerned about the size of this sink as this is our first undermount bathroom sink and the measurements were a bit confusing, despite looking at and measuring ones in our local hardware stores ourselves. This is installed in our 60-inch bathroom vanity and there is plenty of room for 5 inch sconces on either side of our medicine cabinet, with towel rings underneath those. Plenty of counter space, and the sink looks great. Other comments mentioned the overflow being in the front, and that is true on ours as well. Three small holes underneath the faucet, so the photo isn't accurate, but it doesn't bother us. Great purchase! I have done several bathroom remodels in my fixer upper. I loved the look of this sink so much that I repeated it in almost every bathroom. It has a vast amount of space to wash up in. It cleans up beautifully. I highly recommend it to anyone who is considering replacing their bathroom sinks. The size and shape are just was I was looking for on our new bathroom vanity. The vanity is 110” long with two sinks and a drawer vanity in the middle. Easy to clean. Good drainage. Easy install. This sink has been a subtle but attractive upgrade for the master bathroom. It blends perfectly with the new countertops and the scoop of the bowl allows for very easy cleaning. Really like the sink but the overflow is in the back of the sink so you look at it all the time. Nice sink, although I'm not too fond of the placement of the overflow holes. Also, the angle of the sink leaves debris in the sink. Very nice, classic looking rectangular sinks. I really like overflow option. The price on overstock was the best I could find around. Highly recommend. This is an extremely high end sink. My granite fabricator commented about its exceptional quality. I love how deep and roomy it is. I also love the grates. Great purchase! Ordered this right before the holidays and missed the return window. Great quality and excellent looking. Very nice. Heavy. Well made. These look great in the kids bathroom. "Would this sink be appropriate size for a 72 inch double vanity?" Hello, Thank you for your inquiry. The required vanity size is personal preference and custom to the customer's needs. However, based off the information provided it does appear your vanity would work this model sink. 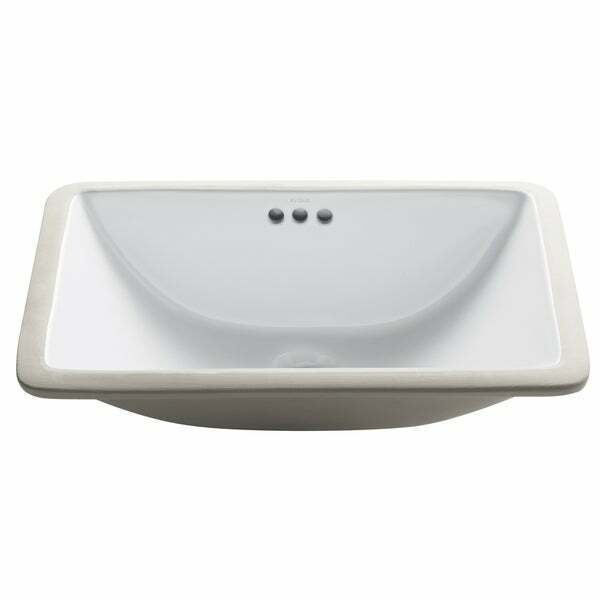 "The interior dimensions of this sink are not given in the written or pictorial descriptions. Does anyone have those measurements?" Interior: 20.86 W x 14.37 D x 6.1 H.
"What are the cutout measurements for this sink?" Please see the pictures below the main one for all details on the dimensions. "How deep is the sink from counter to drain? I am concerned about splashing. I have a sink currently installed, but due to splashing am looking to replace. Have tried turning water pressure down, but doesn't solve the problem." "what is the cutout dimensions?" "Where is the overflow? Back or front. Thanks"
Looked nice for my guest bathroom.